Good things can take time. Just ask Kiwi motor racing legend Ken Smith. 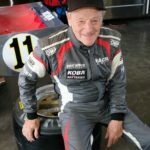 In an unbroken career which now spans 60 years the just-turned-77-year-old is finally getting the chance to compete at the famed Laguna Seca motor racing circuit in the United States. “I’ve actually been there a couple of times, but not to drive,” the three-time New Zealand Grand..